Kajakkspesialisten (the kayak specialist), is a company founded in 1996 by Anders Thygesen, who still runs it. Kajakkspesialisten deals with most things related to sea kayaks, and is most well known for its work in building traditional skin-on-frame sea kayaks and traditional paddles. A Thousand hands ago from anders thygesen on Vimeo. This web site has lots of information about my old and recent activities and projects. 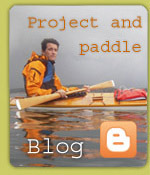 There are articles and video about sea kayak trips and practical issues. You can sign up on a kayak building class, and purchase beautiful hancrafted paddles and other paddle equipment in my web shop. Welcome! If you feel something is still missing, please take contact and let me know. You can read about my trip along the whole Norwegian coast in the summer of 2011 on my blog, and see what's going on at this very moment in my workshop (button on left). Canon Focus | The Adventurer | Feature from Gather.ly on Vimeo.